Michael Shermer (author, skeptic) joins Dave Rubin (The Ruben Report) to discuss conspiracy theories (9/11, vaccines, and more.) Watch the full interview about skepticism, morality, conspiracy theories, and politics. On Monday afternoon, April 11, I appeared on Southern California Public Radio KPCC’s Patt Morrison show to briefly debate (dare I saw wrestle?) 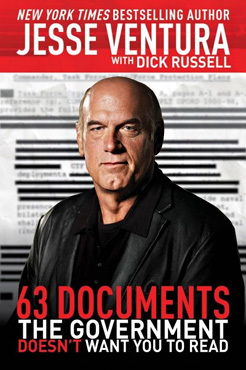 the former Navy Seal, Minnesota Governor, professional wrestler, television host, and author Jesse “The Body” Ventura, who was on a book tour swing through Los Angeles promoting his latest conspiracy fictions he believes are facts entitled The 63 Documents the Government Doesn’t Want You To Read. (The figure of 63 was chosen, Jesse says, because that was the year JFK was assassinated.) Presented in breathtaking revelatory tones that within lies the equivalent of the Pentagon Papers, what the reader actually finds between the covers are documents obtained through standard Freedom of Information Act requests that can also be easily downloaded from the Internet. Surprisingly, given his background in the military and government, Ventura seems surprised to learn that governments lie to their citizens. Shockingly true, yes, but just because politicians and their appointed cabinet assigns and their staffers sometimes lie (mostly in the interest of national security but occasionally to cover up their own incompetence and moral misdeeds), doesn’t mean that every pronouncement made in the name of a government action is a lie. After all, as in the old logical chestnut—“This statement is untrue” (if it’s true it’s untrue and vice versa)—if everything is a lie then nothing is a lie. Likewise, I noted up front on the show, if everything is a conspiracy then nothing is a conspiracy. Given the helter skelter nature of talk radio and Jesse’s propensity to interrupt through his booming voice any dissenters from his POV, I tried to make just four points. 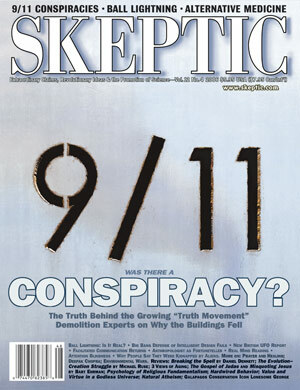 Let’s call them Conspiracy Skeptical Principles. Conspiracy Skeptical Principle #1: There must be some means of discriminating between true and false conspiracy theories. Lincoln was assassinated by a conspiracy; JFK was not. The Archduke Franz Ferdinand was assassinated by a conspiracy of Serbian operatives that triggered the outbreak of the First World War; Princess Diana was not murdered by the Royal Family or any other secretive organization, but instead died by the most common form of death on a highway: speeding, drunk driving, and no seat belt. Conspiracy Skeptical Principle #2: Cognitive Dissonance and the need to balance the size of the event with the size of the cause. 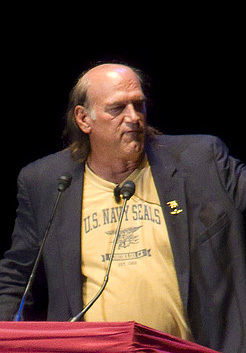 Jesse Ventura said: “Do you mean to tell me that 19 guys with box cutters taking orders from a guy in a cave in Afghanistan brought down the most powerful nation on earth?” First of all, America is alive and well, thank you, even though Ventura has since moved to Mexico. But, yes, as a matter of fact, that is the only way such an event can happen: Sizable cohorts of operatives in prominent positions (Bush, Rumsfeld, Chaney, the CIA, the FBI, et al.) are too noticeable to get away with such a conspiracy. (By the way, 9/11 was a conspiracy: 19 members of Al Qaeda plotting to fly planes into buildings without telling us ahead of time constitutes a conspiracy.) It is the lone nuts living in the nooks and crannies of a free society (think Lee Harvey Oswald, John Hinkley, etc.) who become invisible by blending into the background scenery. Conspiracy Skeptical Principle #3: What else would have to be true if your conspiracy theory is true? Jesse proclaimed on the show that the Pentagon was hit by a missile. His proof? He interviewed a woman on his conspiracy TV show who said she worked inside the Pentagon and never saw a plane hit it. Well, first of all, earlier in the show when I brought up Jesse’s conspiracy television series he discounted it, saying “that’s pure entertainment.” But now he wants to use an interview from that same show not as entertainment but as proof. As well, hardly anyone working in the Pentagon that day saw anything happen because they were inside the five-sided building and the plane only hit on one side, and even there, presumably (hopefully), people are actually working and not just sitting there staring out the window all day. But to the skeptical principle: As I said on the show, “If a missile hit the Pentagon, Jesse, that means that a plane did not hit it. What happened to the American Airlines plane?” Jesse’s answer: “I don’t know.” Sorry Jesse, not good enough. It’s not enough to poke holes at the government explanation for 9/11 (a form of negative evidence); you must also present positive evidence for your theory. 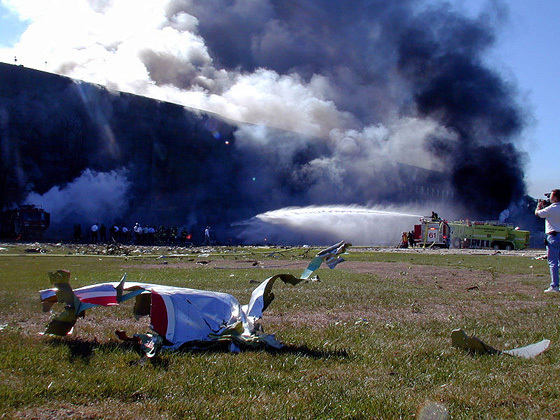 In this case, tell us what happened to the plane that didn’t hit the Pentagon because there are a lot of grieving families who would like to know what happened to their loved ones (as would several radar operators who tracked the plane from hijacking to suddenly disappearing off the screen in the same place as the Pentagon is located). Finally, I directed Jesse and our listeners to www.skeptic.com to view the photograph of the American Airlines plane debris on the lawn in front of the Pentagon, below. Are we to believe that the U.S. government timed the impact of a missile on the Pentagon with the hijackers who flew the plane into the Pentagon? Finally, in frustration I presume, Jesse accused me of being a mouthpiece of the government, just parroting whatever my overlords command me to say to keep the truth hidden. That conspiracy theory happens to be true, except for the part about the mouthpiece, the government, the parrot, and the truth. P.S. 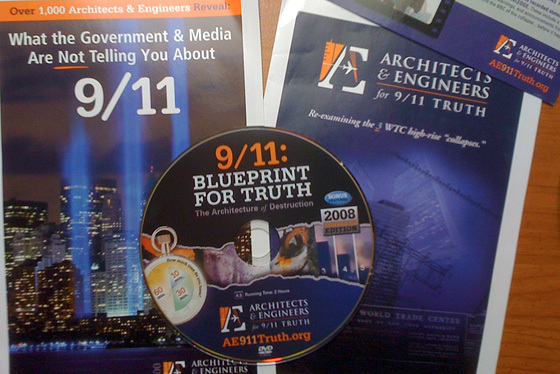 During my recent lecture tour swing through Wisconsin I was confronted at a restaurant by three 9/11 Truthers who were unable to attend my talk that night or even join the local skeptics group meeting that afternoon with me, and instead handed me a pile of literature and a DVD to watch touting the merits of the group known as Architects and Engineers for 9/11 Truth, who appear to hold fast to the belief that the WTC buildings were intentionally demolished by explosive devices AND that the hijackers (whoever they really were) somehow managed to fly the planes into the WTC buildings at precisely where the demolition experts planted the explosive devices—at the exact correct floors, at the exact angle at which the wings were tilted, because that is where the collapse of both buildings began. 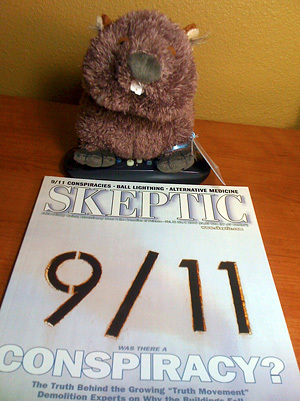 Check it out yourself below, along with our issue of Skeptic on 9/11 conspiracy theories, which was being read in Wisconsin by the little Wombat given to me by my hosts at the University of Wisconsin. 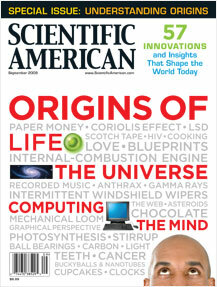 Does Belief Help Us to Survive? I don’t think religious beliefs are different from any other kind of beliefs: political attitudes, commitments to political parties, or economic ideologies, for example. These are all forms of belief. I think at the base of it is this whole idea that we’re pattern-seeking primates. We connect the dots — A connects to B connects to C — and often, they really are connected, and that’s called associative learning. All animals do it. 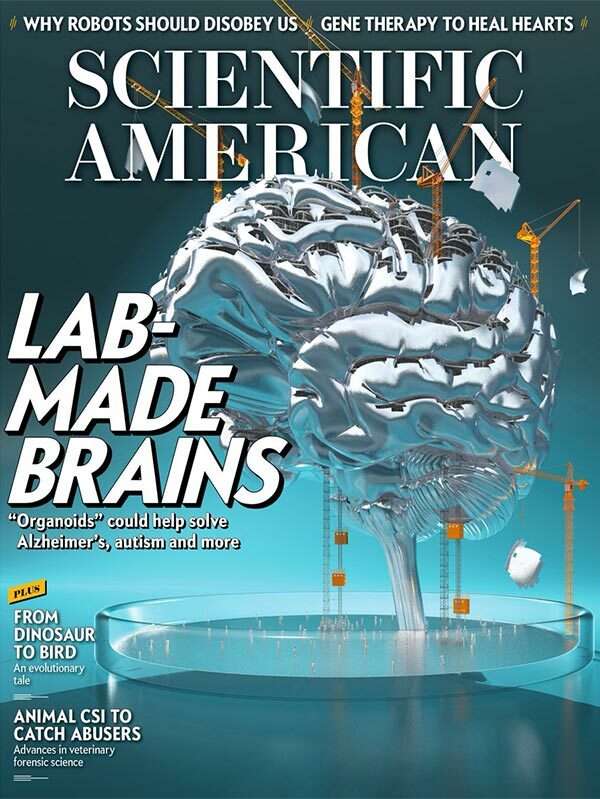 It’s a biological imperative; we grow new synaptic connections when we learn something.